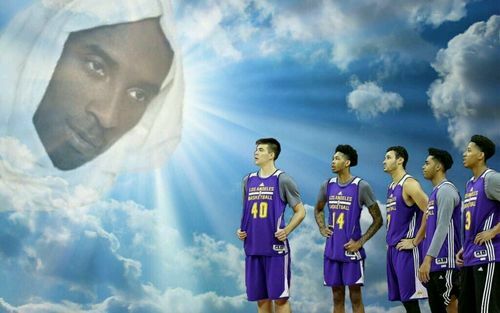 Watching Lonzo and D'lo go back and forth. What a backcourt we could have had. Then again, to get LeBron we'd have had to send Ingram to Brooklyn instead in the Mozgov deal, but then would have drafted Kuzma right after so, I guess there's that. DLO was shooting 40% until he made that 3. He was okay tonight... but he wasn't the second coming. Lonzo shot better than he did... to give you some perspective. Noone is saying DLo played better than Lonzo. Would've been nice to see them playing in the same backcourt though. actually, I was saying that....not sure how anyone could even try to argue that Russell did not have a better game than Ball. Respectfully disagree. I would do the DLo Mozgov trade again without hesitation. What if you'd sent Ingram to the Nets instead with Mozgov and drafted Kuzma as his replacement at the 3? Not that, that is what they should have done. But just a question. And Russell had 13 assists with that 'team of scrubs' too. Controlled the tempo for the most part. His shooting had started to fall off, but he kept playing the PG the right way, and then sank the dagger. Was a great back and forth game from D'lo and Lonzo, but D'lo showed his merit. hell no, should have sent the #2 pick. I started to give it to the entire scrub-filled Net team. 13 assists and only 4 Turnovers? No. Ingram was a #2 pick. I hope the seat he is on is burning hot, (bleep) losing to teams that are sub-500 is unacceptable. Most know that I've been an Ingram supporter... but I started out a DLO supporter until he never seemed to improve. If Ingram is locked at 52% in two years... I will give up on him too. at one time....but when that trade took place, he was the Lakers small forward...hence, I include the #2 pick. While DLO may not have improved ts% wise, he has surely improved as a playmaker. Credit where credit is due; he has improved his assist totals year-over-year since he came in the league. Fact of the matter is, for as much as some of you want to talk about how successful they'll be with Russell leading them. They just won their 6th straight and it was against us.